In 1873, local lumber company Knapp, Stout & Company, Co. provided fifty-two acres to establish a proper burial site. They hired landscape architects, William Merchant Richardson French and Horace Shaler Cleveland, to design the cemetery. French's plan reflects the natural contours of the land and incorporating native trees and shrubs. In 1904 the company transferred ownership to lot owners, who formed the Cemetery Association. Evergreen became an island when planners raised Lake Menomin for a new dam in 1955. The City built a causeway the next year. Evergreen Cemetery is listed on the National Register of Historic Places. Contributors include: GMACF, Menomonie Patriotic Council, Menomonie Rotary Club, Olson Funeral Home, Schendel Family, Talen Trust, Thurin Family, & VFW Auxiliary. NOTE: This is a two-sided marker. See also, Marker 526: Earliest Evergreen Burials. 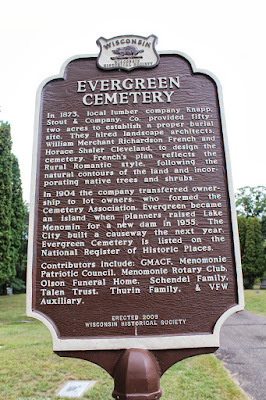 The marker is located at Evergreen Cemetery, Shorewood Drive, Menomonie, Wisconsin 54751. Evergreen Cemetery is located on an island in Lake Menomin. The above coordinates will take you directly to the marker location on the east side of the cemetery. Evergreen Cemetery is listed on the National Register of Historic Places. The view of Lake Menomin when leaving the cemetery.